A real lifeguard assesses Baywatch's depiction of lifeguarding. This man does not always use proper lifesaving techniques. 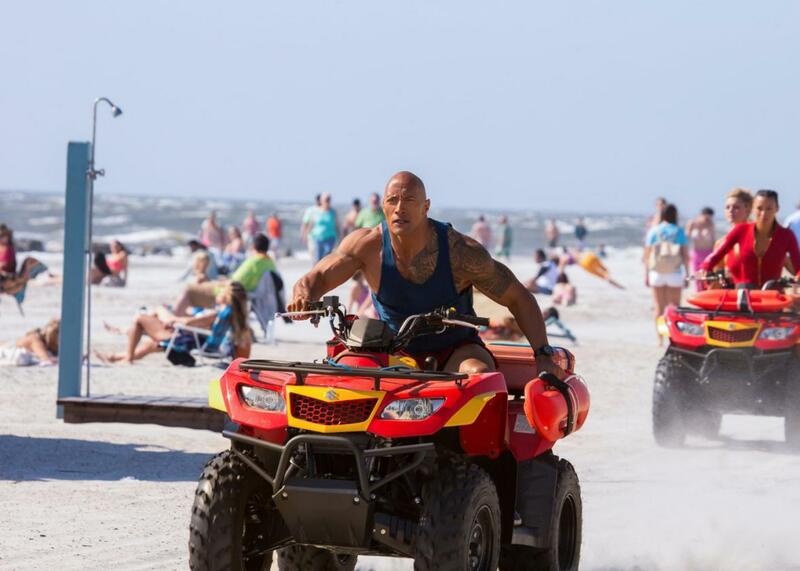 In the new film adaptation of Baywatch, Lt. Mitch Buchannon (Dwayne Johnson) and new recruit Matt Brody (Zac Efron) occasionally take a break from crime-fighting to do their actual job: lifeguarding. But some of the ways that they go about that job did not accord with some Slate staffers’ recollections of their own lifeguard training. Well, it wasn’t a documentary on lifeguarding! It was a comedy and for us as lifeguards to get angry at the film would be similar to police officers getting mad at Reno 911. It was actually much better than I thought it was gonna be. It was funny, it was entertaining. I know the reviews came in—they were horrible. At the same time, it was disappointing, only because there are so many inaccuracies with respect to our profession. Even the terminology they used—they used the word rip tide instead of rip current, which was kind of disappointing for me. And there was a scene where the lifeguards basically abandoned their posts to do some crime-fighting. As a professional lifeguard watching this, I’m always concerned about the image of lifeguards that the general public has, and that’s something we’ve been battling for decades, the idea that we’re 15-year-old kids out there doing a summer job, trying to pick up girls with sunblock on our noses. If you know anything about the industry, it’s primarily—especially in Florida and Hawaii and a lot of California—a year-round, full-time profession. So you see that kind of stuff and you cringe and you hope the audience takes it as a joke, but at the same time it would have been very easy for them to have hired some subject-matter experts and rectified some of those inconsistencies. Wow, so all the people we see in that scene—besides the movie stars, of course—those aren’t just regular extras they had hanging around? Mitch also makes Brody go through some extra challenges to earn a spot on the team. I’m going to go ahead and assume that in real life, there’s no refrigerator-lifting contest required to become a lifeguard. Yeah, that’s definitely a realistic number. When I was a tower lifeguard, we would average 10 to 20 rescues a year, and if you put in 20 years, you could easily get to that number. I think it is important to note, though, that the way the profession works now is that we do a lot of prevention. About 90 percent of what we do is preventing rescues, so to highlight the number of rescues is another kind of problem I had with that scene. It’s easy to have a bunch of rescues. You could allow people to get in trouble just so you could rescue them. So that doesn’t necessarily mean Mitch is a great lifeguard. He could just be slacking on prevention! Right, you’re spotting the dangerous areas and you’re keeping people away from them. Let’s talk about some of the specific saves in the movie. The first is right at the very beginning of the movie, where the Rock single-handedly rescues a kitesurfer who has lost control and plunges into the water, hitting his head. We do rescue kitesurfers! It’s not far-fetched to conceive that a kitesurfer could run into a jetty. I’m sure that’s even happened somewhere in the country. In fact we had a kitesurfer up in Stuart Beach in Martin County, Florida, and he fell into the water and he was attacked by a white shark. What about the way that Mitch carries the victim, though? Slate’s Julia Turner pointed out that scooping him up out of the water like a movie starlet could be pretty dangerous to the spine after a fall like that. It’s basically you stabilizing the neck to make sure there isn’t any further injury to the spinal cord that could cause paralysis. So the initial lifeguard on the scene suspecting injury to the head or neck would hold C-spine, keeping the airway above the water, and then there would be two or three backup lifeguards headed in afterward who would bring a C-collar and a backboard. After that rescue, the Rock is not only completely calm, he goes for a run! He seems pretty chill for someone who just saved a man’s life. You know what, that is kind of funny, because that’s another part of the movie that isn’t necessarily inaccurate. We have days where we could have 30–50 rescues in a day, and then your lunch break comes, and a lot of the lifeguards are very serious about their physical fitness, and they have routines. So it’s not inconceivable to have a bunch of rescues and then go on your lunch break and go for a run. I’m a lifeguard here in South Florida where we have full-time, career lifeguards. Just on my beach alone our average number of years tenure is like 14 years. There’s no such thing as a routine rescue; they’re all different. At the same time, you do kind of get into a routine and handle that adrenaline better with time. Another save I want to talk about: Two kids fall off a pier and their mother jumps in after them, so she needs to be rescued, too. When Brody, who hasn’t yet been trained, yanks her onshore, she’s unconscious, so he starts doing chest compressions—but one of the other lifeguards stops him. The Red Cross for years has been pushing hands-only, compression-only CPR, and that’s targeting the layperson, not the professional rescuer. In drowning cases, hands-only CPR does absolutely nothing, because in drowning cases [the victim has] basically expended all the oxygen in their blood, so by doing hands-only CPR you’re just recirculating blood that has no oxygen in it. The most important thing to do with a victim of drowning is to get oxygen in their blood as soon as possible. You would do that with a bag valve mask with supplemental oxygen. If you didn’t have that, you could just use one with regular air, and if you didn’t have that, you would use a pocket mask and do mouth-to-mouth. In this case, the other lifeguard goes to clear the victim’s airway and pulls out a big chunk of seaweed. I’ve never seen that ever happen. We actually laughed out loud when we saw that scene. We do encounter people with obstructed airways, but it’s almost never in the water. It’s usually someone eating lunch on the beach. The most dramatic save takes place on a burning boat. There’s a boat on fire in the middle of the bay and then there’s also a ring of burning gasoline that has formed around the boat—Mitch actually swims under the fire. Is that really something lifeguards handle? I was watching that and of course it’s all glamorized for Hollywood with the big explosions and all that kind of thing. But I guarantee if a boat were to catch on fire in front of a lifeguard tower, that lifeguard would definitely be the first on the scene, before the police or before the Coast Guard or firefighters. There’s a scene in the movie where the lifeguards are all sitting around eating lunch and listing a bunch of incidents, some of which are taken directly from the Baywatch TV show. I’m going to list off some of those things, and you tell me whether you’ve ever encountered them. OK? OK, here’s another one: Diamond smugglers using surfboards to bring in diamonds. We do have crime on the beach. We have people who steal purses and beach bags. That does happen—at the same time, it is stopped by lifeguards. We had a lifeguard one time named Eddie Robledo, who witnessed some guys going through somebody’s cabana and saw somebody grab a purse and run. This was in the middle of August, where it’s about 95 degrees out. This guy ran down in nothing but his bathing suit and chased these guys for 10 blocks on the asphalt and caught them with passports, credits cards, the family’s camera—he basically saved their whole vacation. No, not tense at all. When I first started lifeguarding, when ocean lifeguarding wasn’t as professional as it is now, we didn’t have a very good working relationship with the police. The police looked at us with the same stereotypes that the public has—that we were just teenagers on summer break. But as the profession came with higher certifications and there were more full-time lifeguards, the police started to respect our skill set, and today we have an awesome working relationship with the police department.